Self-Publishing Author Spotlight: Juna Jinsei, Ph.D.
At Outskirts Press, Inc., we take great pride in celebrating the work of our successful self-publishing authors, and we do so each week through our Self-Publishing Author Spotlight. This week we highlight self-publishing author Juna Jinsei, Ph.D., who has published nine successful titles with Outskirts Press. Learn more about Juna Jinsei, Ph.D. and how her knowledge, experience and holistic healing techniques have influenced her published published works through this week’s Self-Publishing Author Spotlight. Juna Jinsei, Ph.D. is the founder of the World Wholeness Healing Center, where she works alongside other professional natural healers as an instructor and Pastoral Counseling Psychologist. She has been working toward World Wholeness by counseling and teaching people around the globe for over 30 years with her experiences, writing, lectures, seminars, translations, and proven healing techniques. 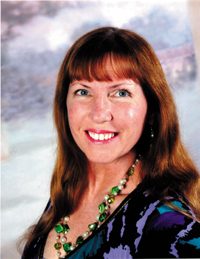 She has created and produced over 40 audio books and holistic healing CDs to help eliminate personal suffering and aid in changing the negative vicious cycles that people unknowingly fall into and allow to control their lives. Juna has spent her entire life pursuing the best means to enable people to achieve self-improvement. Juna counsels and teaches people of all faiths through the application of a variety of proven Metaphysical, Hindu, and Buddhist techniques. Learn how to expand your life to obtain unlimited miracles with YES: You Can Make it Happen. Author, Juna Jinsei, Ph.D., shares her intricate spiritual journey with you and the answers she discovered that can lead all people to indestructible happiness. She teaches readers that attitude is everything in life, if you rid yourself of emotional baggage, it allows you to live the life you deserve and have the freedom of true happiness. No one can successfully overcome the lack of self-confidence, depression, bottled up anger, addictions, anxieties, or other destructive behavior created in life, until learning to be the Master of Oneself. In 100 Worlds to the Inner Cosmos, Dr. Jinsei shares with you the answers she has discovered in the ancient Buddhist scriptures known as the Lotus Sutra. Her innovative style in composing this book has not only made it informative and creative, but also, inspirational and entertaining. It will help you grasp the details and application of the secrets of Ichinen Sanzen, which can open and change your life, allowing you to succeed in all your endeavors so you can achieve a positive self-transformation and joyful reality. Psychologists agree personal happiness is a function of the context in which the world is perceived and internalized. Dr. Jinsei utilizes real life examples to present a philosophical framework for understanding 10 major emotional tendencies and operational personality types, plus 100 subtypes, that one encounters in the world. With her well-known humor and moving wit, Juna Jinsei penetrates the scope of human emotions with their flaws and weaknesses, as well as their deep compassion and powerful potential. Intense passion is portrayed with lyrical beauty and metaphorical grace to open your heart and mind until your true essence can be revealed. Through these verses you will determine where you reside on a daily basis and be able to realize the life you can manifest by elevating your goals and focusing your entire being on the creative inner goodness that exists within your eternal soul. The simplicity and profound teachings conveyed by this well-organized book of poetry are character-building principles, which seem to lose their significance in this stressful modern world. Based on ancient wisdom once taught by Buddhist sages, these strategically composed meaningful verses can help us decipher and control the chaos that surrounds us daily. As you journey through these humanistic life-conditions from self-destruction through enlightenment, you will be led along a soul-seeking path from the depths of your fundamental darkest to the self-discovery of your virtuous entity, and emerge bathed in the light of divinity. Once again, Juna reminds us that even though change may be difficult to accept, it remains to be the foundation of human adventures that inspire innovation and motivation from the challenges it creates. As December 21, 2012 approached, making the end of the ancient Aztec calendar, people were anxiously anticipating a great change in the world. Anthropologists, archeologists, and others in the scientific community gathered the facts and systematically laid them out in a slew of written articles and books. Others took to the radio waves, started Internet blogs, and interviewed on television talk shows to share their professional opinions on the subject. Then, a refreshing wave of remarkable jubilation and elevated awareness filtered throughout the world. The astounding insight and enlightened inspiration that manifested at the annual reunion of the Buddhist Peace Fellowship, composed of various expert spokespersons of international groups representing the humanistic mindset of their faith, grace the pages of this book to reveal the profound complexities of human life and its impact on the environment. By sharing their elevated views amidst sparkling humor, a fresh new revelation is revealed of the human revolution that has begun to take place. Muck Blossoms by Juna Jinsei, Ph.D., is an inspiring tale that depicts the struggle to survive on a ranch built from the sweat and blood required to tame the wilderness in the 1870s. Though it was a simpler time, which would allow pleasant social graces, harmonizing with the beauty of nature, and enjoying quality peace of mind, it was also a period of lawlessness and personal hardship that trampled independent thinking from the aspiring expectations of second class citizens. Kathleen is a girl who learns as she transforms into a woman and raises her family on the wild Wyoming prairie that it is easy to get sucked into the stifling culture that erases one’s individualism and true identity. She becomes aware that one has to learn how to maneuver within the realm of oppression to avoid torture and death. As her family grows she begins to realize her hopes and dreams from a happy childhood can blossom anew from the dust and decay of a broken home. As she faces grave consequences on a daily basis, Kathleen develops the insight to see that it is the struggles, suffering, and obstacles from which her patience, determination, and courage thrive and grow. Though she is a constant pawn controlled by the evil intent that surrounds her, and attempts made to smother her hopes and desires, Kathleen’s strong will protects her from those who threaten to extinguish the flame of love and joy that reside within her heart. As a prisoner of happenstance, she fights to keep her sanity while protecting her children, until she reaches the point of complete uncertainty of whether or not she and her loved ones will actually survive in the dangerous lair of a beastly maniac. The activation of daily affirmations is the practice of acquiring the prosperity you seek and joy you deserve. They are the external stimuli that inspire your emotions, influencing your mental capacities to motivate your actions. They aid you in revisiting your heartfelt dreams and assist you in visualizing yourself as the powerful, compassionate, and self-confident person you are meant to be. Any shortcomings you feel you possess, any weakness you would like to strengthen, or any character flaw you believe needs to be corrected can be transformed by these affirmations into the new and improved you. Don’t be afraid to test the limits of your life. By activating the daily affirmations found in this book, you will soon discover that there aren’t any limits. There is no greater way to promote productivity in the workplace than by supporting the well-being of the employees. Staff should be the first priority, because they are the company’s greatest asset. Without passionate engaged employees, products couldn’t be sold or services properly rendered. FUNdaMENTAL Creativity is a well-organized accumulation of positive entertaining stimuli that can be offered to employees to get the creative juices flowing that will spill out in waves of enthusiastic motivation to achieve the best job possible, resulting in a unified camaraderie and enriched personal pride. By keeping the mind active and alert with challenges that include an element of fun, even the most boring task can be enjoyed until completed. This is because man is naturally a creative being. Creativity, like spirituality, requires a combination of mind, heart, and soul. They go hand and hand, and should be experienced regularly, because happy workers are dynamic workers, and the foundation of a successful business. Playful creativity makes work fun and leisure time more significant. By applying the riddles, puzzles, and challenges in FUNdaMENTAL Creativity, the employees in your office, students in your classroom, or children in your family will have their curiosity aroused and mental energy revitalized so they can reach their peak performance while learning something new every day. Though modern science and technology have dramatically changed our world over the last century, the failings of humankind remain unaltered. The daunting problems experienced by everyone, which continue to fester and increase exponentially, can be solved, if they are clearly identified to enlighten our path and pull us out of the innate darkness with awareness and insight. Counting Down to a Better World systematically reveals the problems and the key to eliminate unnecessary suffering experienced daily by billions of people around the world. This simplistic, yet profound solution discovered in ancient Buddhist scriptures, is the mystic wisdom that can be activated through an easy vibrant practice to heal painful woes and bring joy to the life of every human being. It is through the achievement of this individual happiness that balance will eventually be restored to the environment and peace will spread across the globe. In the Essence of Neverland, Peter is gone, causing the decline of Neverland and a struggle for power. This once abundant world of dreams come true, soon converts into a place of violence and evil without the positive influence of the Pan. Many have gone missing and none can escape its shores. Neither pirates, nor Indians, or Merpeople and fairies have the magic it takes to defeat the demonic darkness that threatens the very existence of every man, woman, and child living on the island. Can anything save them from this pending doom before it is too late? What can prevent Neverland from becoming void of any hope as it turns into a barren wasteland eventually consumed by the sands of time? The answer lies within the essence of this mystical isle, inspiring the hope and motivating the action needed to save them all.